Brandon Coleman is a VA whistle blower who refused to turn away from suffering veterans. 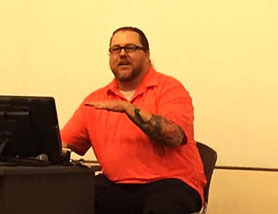 Turning away from trouble was never an option for GCU adjunct professor Brandon Coleman. It wasn’t when he was actively serving his country in the U.S. Marine Corps, and it wasn’t when he witnessed the suffering of suicidal combat veterans while working for the Phoenix Veterans Affairs Health Care System. Even after he was placed on leave from the VA after filing a formal complaint about veterans whose cries for help he said were ignored, Coleman wouldn’t be silenced. 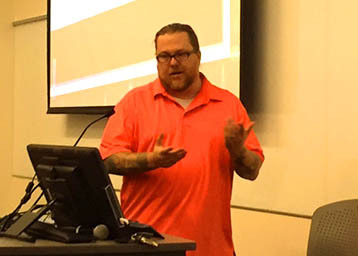 On Friday, the VA whistleblower whose relentless efforts to tell the truth ignited a national investigation that revealed systemic, life-threatening problems at the VA, shared his riveting story with GCU faculty and staff members. 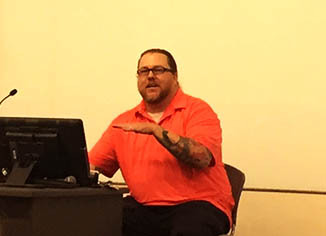 “No matter what the VA does I can sleep at night because I’m telling the truth,” said Coleman, a disabled veteran, recovering addict and father of six who teaches classes in psycho-pharmacology and group and addiction therapy. Coleman worked directly with veterans in his role at the Phoenix VA and also ran a drug rehabilitation program. Between January 2012 and January 2015, he said six veterans he was treating committed suicide as a result of shoddy VA practices. Coleman shared his story with a riveted audience at GCU. Suicidal veterans brought to the emergency room often left because of improper security, he said. In January 2015, he filed a formal complaint. As a result, the VA put him on administrative leave and shut down the drug rehab program, which was treating 71 vets. Coleman said the VA also filed a complaint against him, improperly examined his protected personnel file, intentionally humiliated him and required him to check in with police before receiving treatment for his disability at the hospital. In the year that followed, Coleman gave hundreds of interviews to the media, testified before Congress and gained the support of powerful people. A national investigation was launched that revealed many problems preventing the men and women who served in the military from receiving help in a timely manner. Coleman has been reinstated at the VA and continues to teach at GCU. Kathy Britton, a CHSS counseling professor, said that Coleman’s story provides a strong lesson to future counselors regarding professional ethics. “He was put in an impossible position and had to call out his agency,” Britton said. Courtney Campbell, a senior psychology and criminal justice double major and student worker for the CHSS, said Coleman is another example of the depth of experiences many GCU professors possess.